When you think of action movies what comes to mind? For me there are a few things. There’s that crazy car chase, intense fights, edge of your seat suspense, some really bad villains, and some great acting that makes me believe it’s all too real. Get ready for some action!!! 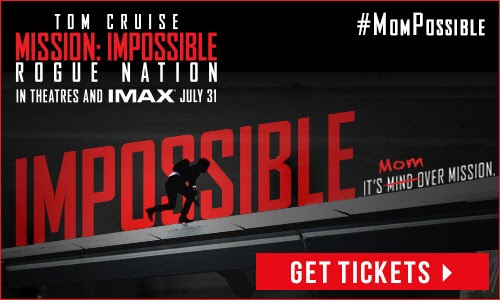 Mission: Impossible Rogue Nation is coming to a theater near you Friday July 31st! Get your tickets right now at Fandango!!! I was lucky enough to attend a sneak peek screening of the movie in NYC this past Wednesday. You know I had to snap a selfie…hey, it was a movie date night!!! Alas, Tom was not in the house…I thought we were going to hang. Oh well. With the IMF disbanded, and Ethan (Tom Cruise) out in the cold, the team now faces off against a network of highly skilled special agents, the Syndicate. These highly trained operatives are hellbent on creating a new world order through an escalating series of terrorist attacks. Ethan gathers his team and joins forces with disavowed British agent Ilsa Faust (Rebecca Ferguson), who may or may not be a member of this rogue nation, as the group faces their most impossible mission yet. Ethan Hunt proves once again he can save the world from every manner of special agent/terrorist and trust in his friends to be there for him no matter what. What about the girl? You know there’s always a girl for Ethan. Is she a good or bad? Check out the movie and let me know what you think! LOL. 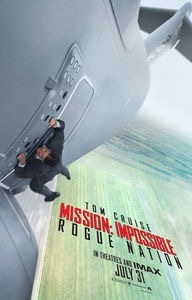 I’ve seen just about every Tom Cruise movie created and he just gets better every time!! He always puts on a great show AND performs all his own stunts, which I think is pretty amazing!! Sure, we can’t all be secret agents and save the world, but we can run ourselves ragged trying to save our family’s world, right? It’s a lot to take on at times. That’s why date time with Bill is really my best #MomPossible strategy. Nights like these keep the marriage going strong. You need some “me” and “us” time away from the kids and away from work. I really enjoyed this movie and I think my kids would love it, too. Maybe my next “MomPossible” move will be to pick up some tix on Fandango and go see a show with Natalie and Liam! No camps in August, baby…so we just have to pick a day!! If you like action, then you and your family will be into Mission: Impossible Rogue Nation. A must see summer blockbuster for sure! This blog post is part of a paid SocialMoms and Mission: Impossible Rogue Nation blogging program. The opinions and ideas expressed here are my own.